Great Mouse Detective, The (film) Animated adventures of a mouse, Basil of Baker Street, who is called upon to search for a toy maker, Flaversham, who has been kidnapped to make a robot replica of the queen for the evil Ratigan. Basil, aided by the intrepid Dr. Dawson, helps the toy maker’s daughter, Olivia, search for her father. They foil Ratigan’s plot and eventually save the queen. Released on July 2, 1986. Directed by John Musker, Ron Clements, Dave Michener, Burny Mattinson. 74 min. Featured voice actors were Vincent Price (Ratigan), Barrie Ingham (Basil), Val Bettin (Dr. Dawson), Candy Candido (Fidget), Diana Chesney (Mrs. Judson), Alan Young (Hiram Flaversham). The score was written by composer Henry Mancini, who also collaborated on two of the three featured songs with lyricists Larry Grossman and Ellen Fitzhugh; the third song, “Let Me Be Good to You, ” was written and performed by Melissa Manchester. Based on Eve Titus’s book, Basil of Baker Street. After a four-year period of story development, animation took just over one year to complete. This remarkably short production span was possible due to new efficiencies in the production process (such as video tests and computer-assisted layouts and graphics), and an increased emphasis on story development prior to the start of production. A total of 125 artists were involved in making the film. An innovative application of computer technology can be seen in the climactic scene where Basil faces Ratigan in a final confrontation inside the turning and thrashing gearworks of Big Ben. The 54 moving gears, winches, ratchets, beams, and pulleys were literally drawn by the computer, and created a unique background for the characters that had been animated in the usual way. 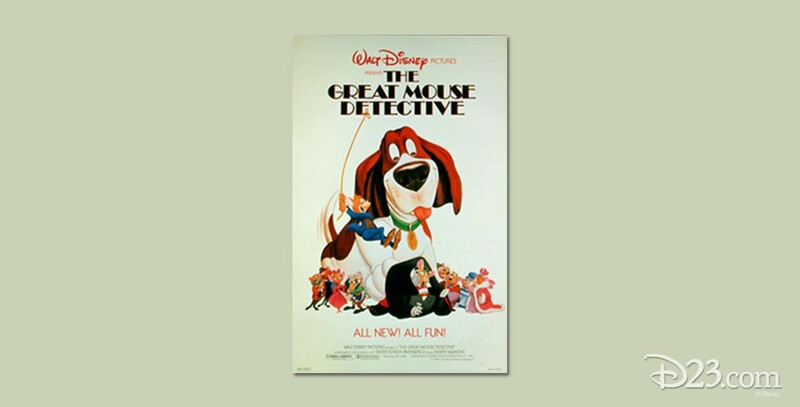 The film was re-released in theaters in 1992 under the title The Adventures of the Great Mouse Detective. Released on video in 1992 and 1999.